This fluted bowl features shades of blues, purples, pinks, and aquamarine. It was made from hand pulled canes which is a two-stage time consuming process. First Dirwood hand pulled the canes used to make this bowl, then he made this bowl with those canes. *Note that the white spots on the glass are reflections from the photo lights. 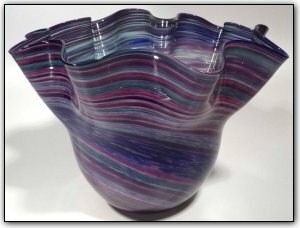 **If you are interested in purchasing a piece similar to the piece of hand blown glass featured on this page, please email us at Archives@HandBlownGlass.com and we will ask the artist to see if a similar piece can be blown. Please be sure to include the HBG Number in your email. Copyright © 2012 HandBlownGlass.com - All rights reserved.